A firestop or fire-stopping is a form of passive fire protection that is used to seal around openings and between joints in a fire-resistance-rated wall or floor assembly. Firestops are designed to maintain the fireproofing of a wall or floor assembly allowing it to impede the spread of fire and smoke. Firestops prevent unprotected horizontal and vertical penetrations in a fire-resistance-rated wall or floor assembly from creating a route by which fire and smoke can spread that would otherwise have been fire resisting construction, e.g. where a pipe passes through a firewall. Fire stopping is also to seal around gaps between fire resisting constructions, e.g. 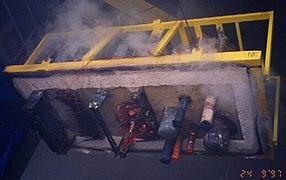 the linear gap between a wall and the floor above, in order for construction to form a complete barrier to fire and smoke spread. Components include intumescents, cementitious mortars, silicone, firestop pillows, mineral fibers, and rubber compounds. Firestops should be maintained in accordance with listing and approval use and compliance. Construction documentation sometimes includes an inventory of all firestops in a building, with drawings indicating their location and certification listings. Using this, a building owner can meet the fire code relating to fire barriers. Improper repairs may otherwise result, which would violate the fire code and could allow a fire to travel between areas intended by code to be separated during a fire. It is often necessary to install new electrical cables or mechanical systems through a hole in a fire-rated barrier which has been firestopped during construction. In this case, the firestops are "re-entered". To maintain a building's original fire-protection plan, firestop re-entries must comply with the certification listing upon which the original configuration was based. Spray fireproofing of structural steel is best accomplished before interior partitions are built. Otherwise, a conflict with firestops in firewalls could result. Firestops must adhere to the bare, dry, unobstructed surfaces of the fire barrier which is penetrated (metal decking, for example), or adjacent to an interface of two fire barriers at which fire stopping is required (such as beams). Spray fireproofing cannot be applied before firestopping on these surfaces, since the fireproofing would obstruct adherence of the firestop materials to the fire-barrier surfaces. Spraying the upper room perimeter with fireproofing may also cover wall or ceiling joints and through penetrations which require firestopping. These joints are then not provided with proper firestopping, violating the integrity of the passive fire barrier. Proper maintenance is enhanced by the installation of tags on each side of the firestop with information needed to refer to documents indicating approved procedures for the original installation and re-entries. This requires knowledge of the certification listing used for each opening of a building joint or a penetrant through-penetration seal. Firestop materials are not rated per se. They receive a fire rating by combining materials in an arrangement specific to the item (a pipe or cable, for example) penetrating the fire-rated wall or floor and the construction arrangement of the fire-rated wall or floor. 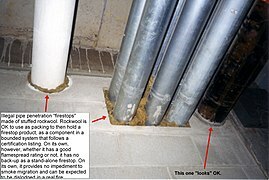 A two-hour-rated pipe-penetration firestop may consist of a layer of caulking over packed rockwool. The arrangement, not the caulking, provides the two-hour rating. 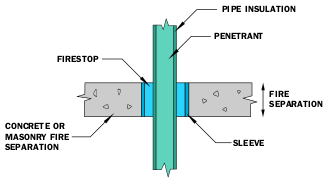 The individual firestop materials and the overall firestop assembly are listed. When the installed configuration does not comply with the appropriate certification listing, the fire-resistance rating may be lower than expected. When it is difficult to assess the impact, it often must be assumed to be zero and the building's fire-protection plan is compromised. Each opening in a fire-resistance-rated wall or floor in a building must have a certification listing. There are thousands of listings from various certification and testing laboratories. The Canadian and United States Underwriters Laboratories publish books listing firestop manufacturers who have contracted with them for testing and certification. Firestops should be routinely inspected and maintained to mitigate the effects of time and re-entries. In North America, composite crews are required when working near live electrical conductors; an electrician is required to observe and ensure the safety of the insulator. Germany's Gütegemeinschaft Brandschutz im Ausbau also offers a passive fire-protection course resulting in a Brandschutzfachkraft (Passive Fire Protection Expert) certificate. 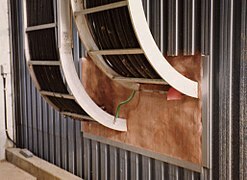 The material types used and the skill sets needed in insulation and firestop installations are similar. Exceptions to the rule that firestopping is insulators' work include firestop devices which become part of a plumbing system and which must be installed by plumbers during the forming of concrete. Older buildings often lack firestops. A thorough inspection can identify all vertical and horizontal fire barriers and their fire ratings, and all breaches in these barriers (which can be sealed with approved methods). Firestops created by contractors or building maintenance personnel which are not listed, sometimes called "deemed-to-comply," are not credited with an adequate fire resistance rating for building-code compliance purposes. They are usually short-term, cost-cutting measures at the expense of fire safety and code compliance. One common error is citing a listing for a product which may be for another use. An insulation with an active listing of a certain flame-spread rating is unacceptable for firestopping purposes. Stuffed fiberglass insulation would rapidly melt and fall out in a fire. Polyurethane foam used to fill a cable tray penetration; at Browns Ferry Nuclear Power Plant, this seal resulted in significant fire damage. Wikimedia Commons has media related to Firestop, Re-entered but not resealed firestops, Firestop tags, Fire testing, No firestop at all – empty hole and Home-made firestops. ^ "Fire Stopping: What Every Contractor Needs to Know | EC Mag". www.ecmag.com. Retrieved 2017-09-06. This page was last edited on 11 April 2019, at 19:16 (UTC).